Notes: Sweet, sparkly and water clear; these naturally double terminated quartz crystal earrings measure about 14x10x9 mm / 10+ ct. total. 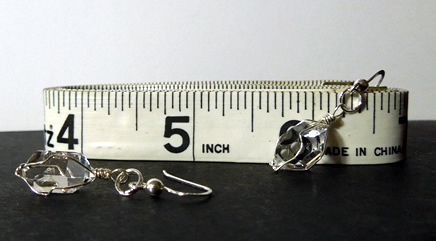 Complete dangle earring is 1.5". Window facets and a teeny seed crystal inclusion are present. Minimal natural growth manifestations on Herkimer Diamonds in no way deters from their beauty, but rather adds interest and proves authenticity. 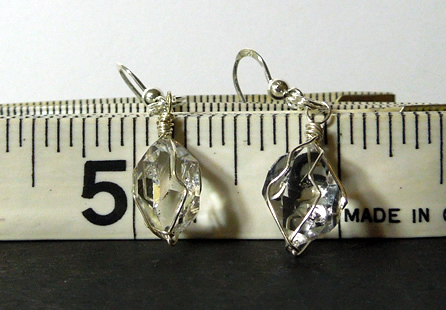 The Herkimer crystals wrapped in fine .999 silver wire shine bright as they dangle from Sterling Silver French ear wires. 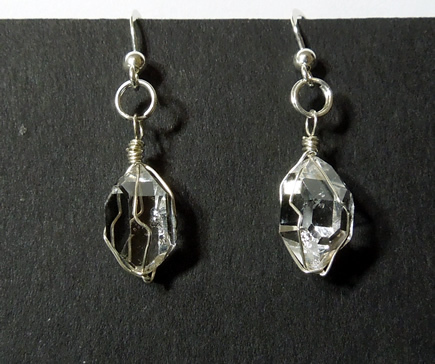 A quality pair of wire wrapped crystal earrings. A beautiful set of natural Herkimer quartz crystals.